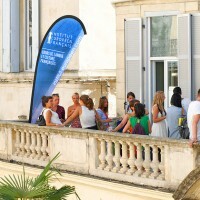 Montpellier is the second most popular destination to stay and learn French after Paris. In this beautiful city you can enjoy 300 sunny days a year. The school is located in two buildings, recognised as historical heritage sites by the Architecte des Batiments de France. Montpellier, the capital of the French Region of Languedoc-Rosellón, is a beautiful city situated in the south of France where you can enjoy the sea whilst learning French. The medieval city has 250,000 inhabitants, boasting both natural and manmade beauty. There is a mixture of modern and ancient architecture, with top works by international architects. It is known as one of the biggest student cities in France with a great nightlife. A cosmopolitan city perfect for studying French – Montpellier is the one for you! The school is situated in one of the most beautiful private hotels in the city with large, bright classrooms. The European Institute of French provides quality French lessons of which French is studied as a foreign language. The institute is one of the best in France. 22 lessons of general French a week, equivalent to 16h30. The classes are small groups of international students, with a maximum of 12 per class. They start any Monday of the year, except Christmas and are a minimum of one week long. The classes develop the following skills: Oral/Written comprehension and expression, the use of French in everyday life as well as learning through media such as newspapers, photos, audio and videos. 28 lessons of general French a week, equivalent to 21 hours. For practicing and speaking (presentations, exhibitions), interacting (speaking one on one, exchanges). Also includes learning about how to use French in everyday life situations and France’s culture, improving a student’s fluency. Host families – Ideal for being totally submerged in French culture and its rhythm of life. In this way your French skills and understanding will progress rapidly. This is only available to those under 18 years of age. Shared Apartment – our team carefully visits and selects apartments that are in a bound quality contract with the European Institute of French. The apartments are not far from the school, a maximum of 15 minutes away with the option to walk or take public transport (tram or bus). You will get our own room with a shared kitchen, dining room and bathroom. Typically there can be up to 4 people per apartment. Private Apartment – Selected carefully by our team, the apartments are also bound by a quality contract to with the European Institute of French. The apartments are maximum 20 minutes away from the school, again with the option of walking or public transport. Each apartment is different but they are all designed to make you feel at home with your own bathroom, kitchen filled with utensils, a TV and bedroom. Specialised advice for choosing your personal course, preparation for your departure, flight management and monitoring/assistance during the stay. Training material, a test to determine your language level at the beginning and end of the course to show your progress as well as an accredited diploma. Flights, airport transfers, medical insurance and trip cancellation are not included. Ask us for more information. The nearest airport is Montpellier Mediterranée Airport.